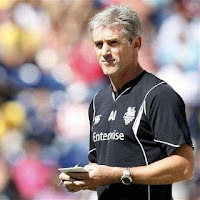 Huge surprise to hear on the sports news a few minutes ago that PNE boss Alan Irvine has been sacked. Already there are many posts (see BBC 606 Comment page) expressing surprise, outrage, and disbelief. The official announcement on PNE.com is here. I have been to see several PNE games (with my brother Brian) - the last being a 0-0 draw vs Reading. At this game the PNE fans were chanting his name all the time "Alan Irvine's Yellow Army!". PNE made the play-offs and everyone was delighted at such an achievement for a small club on a tight budget. Irvine was a target for West Brom in the summer, but stayed out of loyalty to PNE. After a run of only one win in 10 games, he gets sacked - not much loyalty from the club to him. While 1/10 is a poor run (in fact it's relegation form), it does seem to all to have been a very hasty reaction by PNE chairman Derek Shaw. Irish international Sean St Ledger has returned from loan at Middlesborough (PNE's bad form started after he left). He was supposed to stay. Something is not quite right, and I, along with many posters on the Web feel that there is something behind the scenes that we don't know about. All the best Alan Irvine - no doubt you win't have long to wait before getting another job.